When you make homemade biscuits for your dog, you have the peace of mind that comes with knowing exactly what's in them. Plus, you'll never have to worry about recalls. Try all four of these recipes, and see which ones your dog likes best. Begin with this basic recipe. Once you've made a batch, you can experiment with the variations below. In a large bowl, thoroughly blend together the dry ingredients. Make a well in the center, and add the wet ingredients and the egg into the well. Mix the wet and dry ingredients completely. Roll the dough out on a flat surface with a rolling pin until it's about one-half to one-quarter of an inch thick. Use a cookie cutter to cut out shapes from the dough, and place them on a greased baking sheet about one inch apart. Place the baking sheet in the oven, and bake for 20 minutes. Turn the biscuits, and bake them an additional 15 minutes. Remove them from oven and allow them to cool. Keep the biscuits refrigerated, and use them within three days. They may also be frozen for up to two months. Add 1/4 a cup of peanut butter. Use unsalted chicken or beef broth instead of water. Add a tablespoon of bacon grease and reduce the oil by one tablespoon. Add 1/4 cup of canned pumpkin. Substitute 1/4 cup of potato flakes for 1/4 cup of flour. 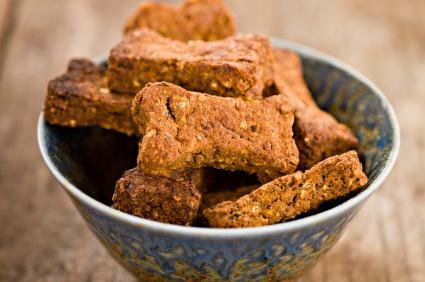 If you want to give your dog a biscuit he'll really flip for, try this recipe. Your dog will love you for it. In a large bowl, completely dissolve the brewer's yeast in one cup of warm water. Add the other ingredients and the remaining water. Stir completely until the mixture is the consistency of thick paste, and add additional water if necessary. Cover the bowl and allow the mix to rest at room temperature for 30 minutes. On a floured surface, roll the dough out with a rolling pin until it is approximately one-half of an inch thick. Cut out individual biscuits with a cookie cutter or drinking glass rim. Place the biscuits on a greased baking sheet, and bake them until they are crisp and firm, about 45 minutes. These biscuits may be refrigerated for no more than three days. Dogs with a sweet tooth will enjoy these mildly sweet biscuits made with natural honey, which is a healthier choice than using refined sugar. In a big bowl, proof the yeast by dissolving it in the warm water. Let the mix sit until it begins to foam. Once the yeast blooms, add in the broth, honey and egg and stir. Gradually stir in the flour just until the mix is moist. Add a little extra flour if needed to make the dough firm. Turn the dough out onto a floured board and gently knead it into a ball. Roll the dough to about 1/4 inch thick and cut it into shapes with your favorite cutters. If you prefer, you can roll the dough out in a rectangle and simply cut it into squares or rectangles. Place the biscuits on a cookie sheet that is lightly greased with non-stick spray. Using a thin skewer, poke a few holes in each biscuit to help them bake more evenly. Bake the biscuits at 350 degrees F for approximately 45 minutes, and flip them over halfway through so they bake evenly on both sides. The biscuits need to dry sufficiently so they become crisp. Removing the extra moisture also helps preserve them longer. Ovens vary, so you may need to extend the baking time to achieve the desired texture. Let the biscuits cool and dry for at least 12 hours before Fido gets his first treat. This gives them time to become nice and crisp, which makes them better for your dog's teeth. Store the biscuits in an airtight container in a cool place for up to two weeks. Carrots and applesauce might seem like odd ingredients for a dog biscuit, but dogs really love the way these foods taste. If you don't believe it, make a batch of these biscuits and let your dog be the judge. In a large bowl, combine the carrots, applesauce and eggs. Stir until combined well. In a separate bowl, combine the flour, oats and wheat germ. Stir them together, and gradually add the dry mix to the wet mix. Stir all the ingredients together, and add a little more flour if needed to make the dough firm enough to basically hold its shape. Turn the dough out onto a floured board, and roll it to 1/4 inch thick. Cut the dough into bars, and place them on a non-stick cookie sheet. Bake them at 325 degrees for approximately 50 minutes, and flip them halfway through the baking time to ensure even baking. The biscuits are done when they are a deep golden brown. Allow the biscuits to cool completely, and keep them stored in the refrigerator for up to two weeks. Dogs can eat many of the same foods that people eat, so you can improvise a bit with some of these recipes. However, there are a number of food items you should definitely avoid including in your biscuit recipes because they can potentially make your dog sick. Offering your dog treats made from one of these biscuit recipes is a great way to show him you love him. Just don't overdo it. 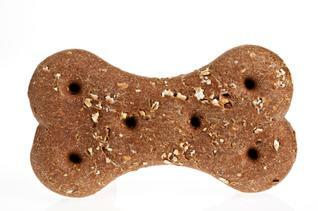 Even healthy snacks are not a replacement for a well-balanced diet of high quality kibble. Save the treats for special moments.